Using annuities with guaranteed income features creates lifetime guaranteed increasing income that cannot be outlived. Look at how the income quickly drives down the account value even when earning a 4.00% fixed rate with no negative years. How long would $407,000 last for a 60 year old couple if they could earn investment returns of 4.00% guaranteed every year, net of fees and took the same income stream? Income guaranteed for the life of both spouses. They would run out at age 92. 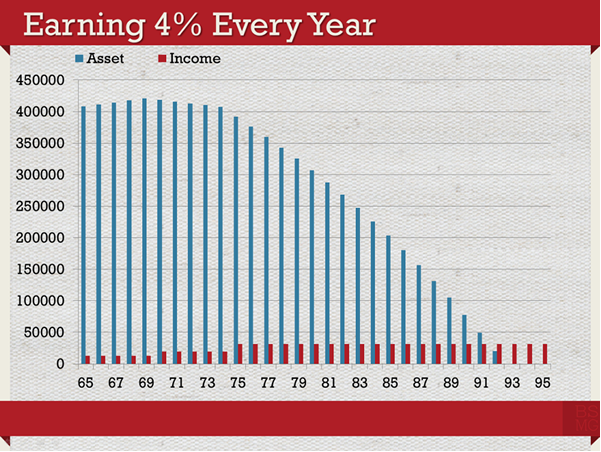 If the investment returns were 3.00%, they’d run out at age 87. Incidentally, joint life expectancy for a 65 year old couple is age 92. This means they have a 50/50 chance of running out of income at age 92. Call us about our new income solutions – our annuity team is ready to help!